Only 4 out of 12 security packages detected all the threats error-free, 4 overlooked individual malware specimens, and an additional 4 had a detection rate that was unsatisfactory. In the relevant portals for Mac users, there is a general consensus when it comes to security solutions: they are not needed, as Mac OS X utilizes its own internal protection mechanisms. What everyone fails to mention, however: Rather than shutting down internal system protection, all protection solutions for Mac OS X fortify it! Each solution works in parallel to Mac protection and thus raises security to the highest-possible level. 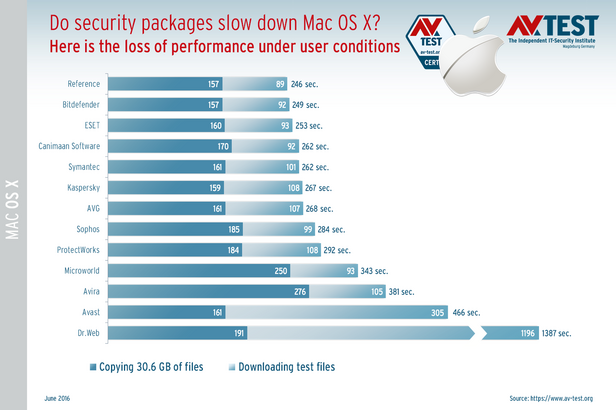 The second counterargument that security suites supposedly slow down performance of Mac OS X is dispelled by the current test as well; at least for most solutions. 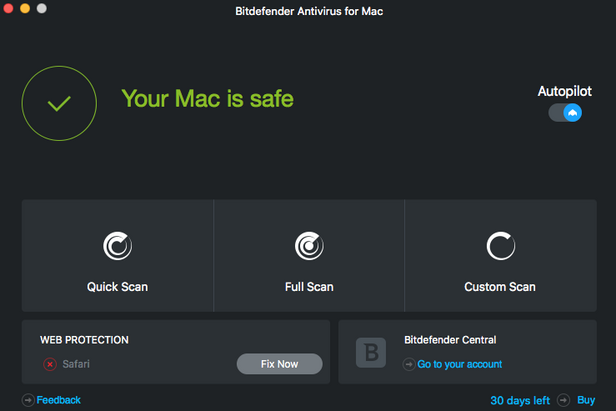 while Bitdefender and ESET hardly slow down the system at all, Avast and especially Dr. Web delivered very unsatisfactory results. The package detected all the malware threats in the test, with almost no burden on the System. The freeware package achieved an impressive 100 percent in detection, but to do so, it does require 10 percent of system resources. 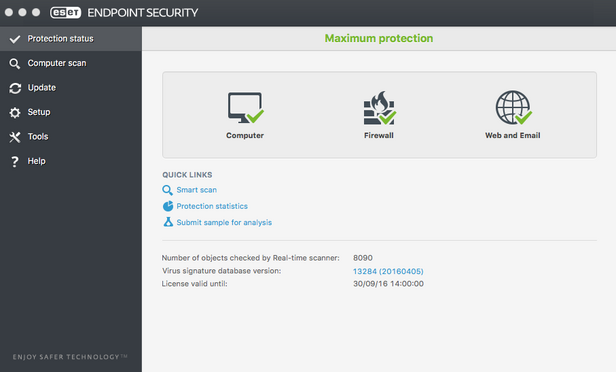 The two charts with the test results quickly reveal that the protection solutions from Bitdefender and ESET, despite 100% detection rate, cause little or no burden on the system. They require for their own performance a mere 1 to 2% of system resources. Most of the other solutions in fact require up to 10% system resources for security performance, in some cases even more. A total of 4 out of the 12 tested security suites are available free of charge: AVG, Avast, Sophos and Avira. The package offering the best detection in combination with the lowest system load is from AVG. For 100% detection performance, it does require roughly 10% system resources, however. In the detection of malware, 4 out of 12 packages achieve top performance of 100%: AVG, Bitdefender, ESET and Microworld. Four additional packages make minor errors and detect 99.17 percent: Avast, Kaspersky, Sophos and Symantec. There is a sliding scale of detection for the products of Dr. Web, Avira, Canimaan Software and ProtectWorks. They only detect 49 to 98.33 percent of the malware tested. 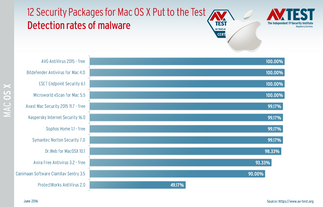 The lab used 120 selected Mac malware specimens that it collected a few months prior to the test. Many Macs also work in heterogeneous networks together with Windows PCs. While Windows malware is incapable of harming Mac OS X, it can, however, harness the Mac as a platform to continuously re-infect a network. For this reason, the lab examined how well the packages also deal with Windows malware specimens. The results of this test phase were not rated, as they are not a traditional protection function of a Mac protection solution. ESET demonstrated excellent performance when it came to detecting over 11,000 selected Windows malware threats. Following close behind, also delivering good performance, were the solutions from Kaspersky, Bitdefender, Microworld, AVG and Avast. The additional products are not satisfactory in terms of detection. ProtectWorks is even far outside the bounds of acceptable malware detection. For the load test of the security packages, 839 files, representing a volume of 30.6 GB, were copied on a reference system, and many downloads were performed. The time needed for these tasks served as the reference value in the test. As soon as a protection solution was installed, it was required to complete the same tasks. The relevant times required are listed in the latest test chart. The results, however, could not be more diverse. The reference time was 246 seconds. As already mentioned, the packages from Bitdefender and ESET, with 249 and 253 seconds, hardly put the brakes on the system. The other values from Symantec, Canimaan Software, Kaspersky and AVG are good up to the clocked 268 seconds, however they're not great. But after Sophos with 284 seconds, the values continue to increase significantly: from 292 to 466 for Avast. The nearly unbelievable value of 1387 seconds was measured for Dr. Web. That is more than 5.6 times the reference value. Under each installed security solution, clean, popular software programs were installed, launched and updates were loaded. All 12 solutions monitoring these procedures did not trigger any false positive. That's the way it should be. As an additional non-rated test, the laboratory in turn examined the behavior of security suites in case of unwanted software. The "Potentially Unwanted Applications", or PUA for short, are pesky programs, yet not considered malware. However, there are always divergent views on the topic of PUA among testers and software manufacturers. Because what is merely annoying to manufacturers may often be considered malware to the testers – and even vice-versa. A total of 10,500 of these applications were supposed to be detected by these security packages and blocked if possible. The result: only 7 system watchdogs performed superbly: AVG, Bitdefender, Dr. Web, ESET, Kaspersky, Microworld and Sophos. 2 programs demonstrated only a below-average PUA detection rate of 50 to 75 percent. In addition to the security component, a total of five out of 12 security applications offer the user no additional features. 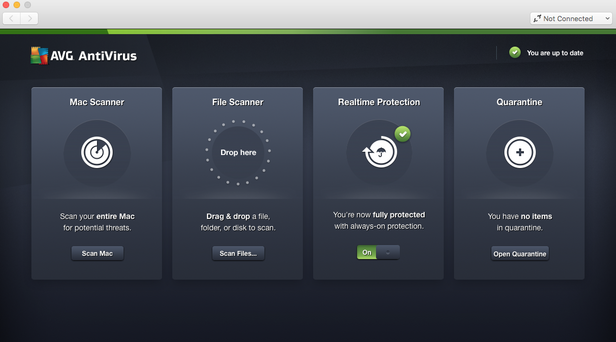 The other suites offer extras such as safe browsing functions, a firewall or parental control functions. In a few individual cases, there are also useful tools against network attacks. The number of extras depends on whether the software is paid for or distributed for free. Apple's Mac OS X is already designed secure, thanks to its internal protection components. Yet even Mac systems are moving closer into the cross-hairs of attackers. This is also manifested by reports of initial ransom ware attacks on Mac users. That is why those seeking to enhance their system to the highest level of protection ought to take a closer look at the security packages available. 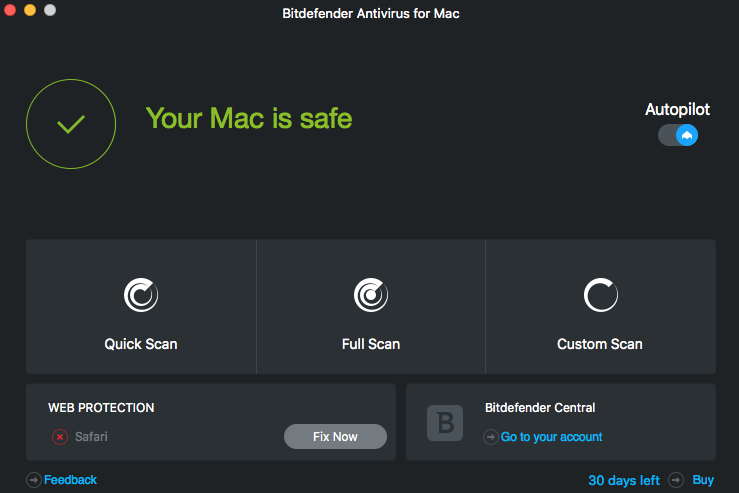 The packages from Bitdefender or ESET in particular demonstrate that hardly any additional resources are required for enhanced protection. If the additional protection is to be provided for free, then the AVG package is recommended for use. However: For 100% detection performance, it does require roughly 10% system resources. By comparison, the paid programs require only 1 to 2 percent in this category. As an additional note from the testing team: MacKeeper was supposed to also be evaluated. But during the test, the product no longer received any updates. The manufacturer then had to admit that due to internal problems, users of MacKeeper were no longer receiving any updates for nearly 3 months. For that reason, the testers removed the application from the test group as untestable. Furthermore, the product from Intego is not included in this test. At the beginning of the test, the manufacturer was preparing the launch of the new X9 version. That is why Intego no longer wanted to participate in the test with the old X8 version. Those interested, however, may also refer back to the test from AV-TEST dated December 2015.